Grab a loved one and see Exodus: Gods and Kings this opening weekend. 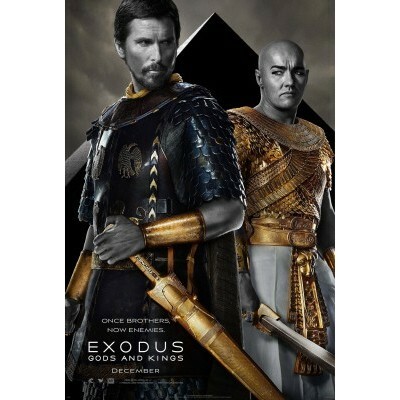 Exodus is an old fashioned epic about Moses that deserves to be seen on a real movie screen. An opening scene with a fierce chariot battle highlights the grander of the Egyptian Empire. All of those expansive widescreen shots underscore how ridiculously difficult it was for the Hebrew people to beat a Pharaoh. This movie has a gritty realism that makes the familiar Bible story more intense. All the Hebrew slaves are so identically dirty that it was hard for me to pick out Moses' brother Aaron for a while. The plagues of flies, frogs, and boils are each truly gross. It's a guy's movie with lots of battle scenes and gory death shots. It also has some tender love scenes and creative ways to illustrate a man in prayer. As someone familiar with the Bible Story, I had some moments of confusion and disagreement with the plot. For a few moments, I wondered why Moses was starting acts of guerrilla warfare with his cousin the Pharaoh instead of negotiating with the familiar refrain "Let My People Go!" However, the visual poetry of the Burning Bush scene really won over my heart. I relaxed and let the filmmakers take me on the movie journey they wanted to explore. I ended up thinking deeply about parts of the Moses story that were brand new to me. I loved the part where Moses' wife thinks that all this talk about God's plan for him is simply a hallucination after Moses hit his head on a rock. Moses' moments of doubt and humility are clearly shown by actor Christian Bale. This Bible story happened to real people. This film highlights all the reactions of people around Moses, as well as the internal struggles he faces within. I loved this movie because it made me think. There is a Jewish tradition called the "Midrash" where writers talk about "what could have happened in the Torah." Exodus the movie is not Exodus the book. However, the differences only highlight the amazingly awesome power contained in our Scripture. I think this movie is best attended with friends. The conversation afterwards about "What did you like?" or "What didn't you like about it? " is lively and intense. (My daughter Hannah wanted me to post that she did not like how the parting of the Red Sea was shown in this movie. "The ocean didn't open up! What the heck?") I love a movie that can inspire this much debate on the car ride home. I'm inspired to reread the book of Exodus with my family today. I'm more thoughtful about who Moses was and how his epic journey with God is similar to my own. Art provokes. It's a joy to attend a movie that made me reflect more deeply about the Bible on the way out of the theater than on my way in!